It was only about a year and a half ago I finally left my job to stay at home with my daughter. I had worked there for several years and had grown into a comfortable position in the company that paid well, but I never loved it. I had done it for so long it grew tedious and boring, and I wanted out. The job didn’t challenge me, I needed a creative outlet, and I missed my daughter. I hated dropping her off at daycare every day to go to a job I didn’t enjoy. I always thought I’d be a stay at home mom when I had my daughter, but there I was working in a job I didn’t care for that stole all my time away from the person who needed me the most. It didn’t feel right. If you’ve ever dropped off your crying child to a daycare provider and had to pry their fingers off your shirt as you leave, you know how heart-wrenching it can be. It ruins your day. Kids want time with their parents more than anything, and it feels completely unfair to have to trade time with your child so you can earn more money. You don’t have to live that way if you don’t want to. You can make changes in your financial life to give your children more of your time when they need it most. If you’ve been wondering if you can afford to be a stay at home parent, take these 4 things into consideration. Because it can be scary to think about living off of one income, try it before you quit your job to see if it’s possible for you. That was the first thing we did when I was thinking about staying at home, and the only way I knew how to start was to go in full force. My husband’s paycheck was deposited into our checking account, while my income was deposited into a separate account, and we lived off of one account exclusively. Starting was the hardest part, and there were some hiccups along the way. It’s much better to feel things out while you still have another paycheck to fall back on. Budgeting or tracking your spending is key. Once we made some adjustments, we got used to it and realized we could actually do it. We did have to cut back here and there, but it was nothing we couldn’t live without. The trade-off of not eating out so much and trying to comparison shop for groceries was well worth it in our situation. I know not everyone is in the same financial situation we were in at the time, but realizing how much we were spending on stuff that didn’t matter to us really opened our eyes. We made the cuts where necessary, and once we decided we were okay living off of one paycheck, we moved on to our next step. Luckily, we were able to build up a pretty sizable emergency fund from saving my paychecks while we adjusted to living off of one income. By the time I was ready to give my notice, we were set. That financial cushion was so important to me. I know if we didn’t have that money saved up, I wouldn’t have felt comfortable enough to quit my cushy job. Give yourself peace of mind with an emergency fund before you put in your notice. It will help you sleep better at night. Try not to worry so much about the “what-ifs.” That’s what the emergency fund is for. As a non-working parent, you’re now your family’s insurance policy. What I mean by that is, if the worst happens and the breadwinner of your family loses his or her job, you don’t have to panic. You’ll have an emergency fund to fall back on, and, if needed, you can go find a temporary (or permanent) job until your spouse is back on their feet again. Your availability to work again is your new insurance policy, so cash in on it while your kids are still young. If you really feel like you can’t quit your job outright, you still have options. If most of your job is computer-based, ask your employer if you can work remotely from home (even a few days a week could help). If that’s not a possibility, try going part-time or working four 10-hour shifts instead of five 8-hour shifts. The hours will be longer for 4 days, but you’ll have that fifth day completely free for you and your kids to do as you please, and each weekend will be a long weekend. You could also consider starting and developing a side hustle out of your favorite hobby, like I did with freelance writing. I don’t make as much money as I used to, but the supplement definitely helps. I also like that I’m still contributing something financially. With a side hustle, you can also work as little or as much as you want to because you are your own boss. Today, I’m so happy to be a stay at home parent. For a while, I struggled with feeling like I should be earning a bigger income. When I became a stay at home mom, I felt like I had lost a bit of my self-worth until I realized there’s so much value in staying at home with my daughter. I may not be bringing home my old paycheck, but I’m still giving lots of value to my family. I may have missed my daughter’s very first steps at daycare, but once I quit my job, I got to be the one to teach her her ABCs and take her to the zoo and story hour at the library. I got to be the one who baked cupcakes with her in the middle of the day on a Tuesday just because we wanted to. Even on days when we’re not actively doing anything exciting, I’m happy because I get to be there with her. If nothing is planned for the day, it’s still absolutely worth everything I’ve sacrificed. It’s where I want to be. 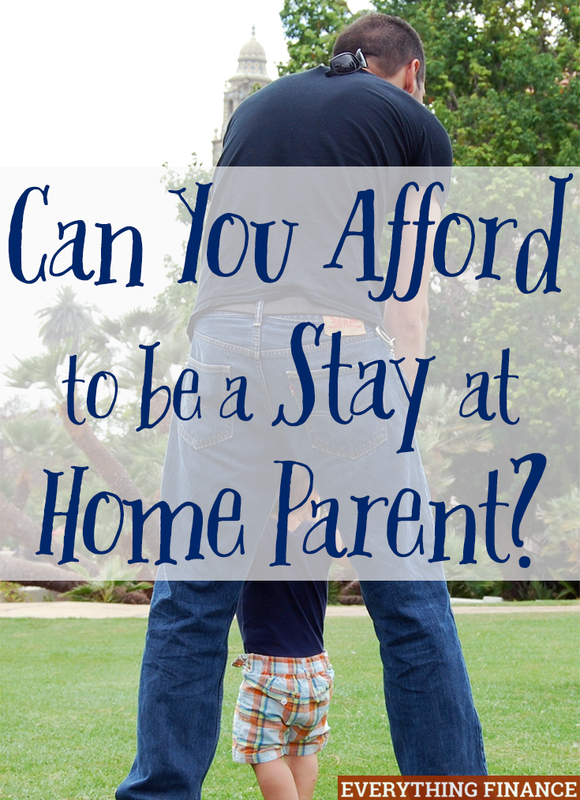 Have you ever wanted to be a stay at home mom or dad? Does living off of one income sound intimidating to you? What areas could you cut from your budget? I am staying at home with my kids while they are young, and I agree that practicing living off one income first is a great way to transition. We even bought our house with this in mind, although I wasn’t pregnant yet. I’ve also found that staying at home gives me the time save money by cooking from scratch most nights, hanging laundry to dry, checking thrift stores for stuff we need, etc. Though I’m not saving as much as I could make, these tasks fit into my days at home with the kids way better than working could. I agree. We may not be saving as much as we could be making, but it’s worth the trade-off right now. We’ll never get this time back whit our kids! My wife’s last day of work is Friday and then she will be staying home with our 6 month daughter. For us, the adjustment of having so little time each day with our daughter was enough to push us towards making a change. My wife enjoys what she does for a living but she loves the idea of being home with the little one more. Luckily, we are fairly frugal to begin with so we didn’t have a lot to cute. We’ve run test months for the past two and are now ready to go! That’s awesome, congrats! She won’t regret that decision. 🙂 There will always be more time to work, but the kiddos are only this little for such a short period of time. Thanks for sharing your story. This is such a big and scary decision for working moms. I was wondering how long it was between when you made your decision and when you actually gave your notice? And, how long do you plan to be out of the workforce? It is absolutely a big and scary decision. It definitely was for me. I thought about leaving for months, maybe even years, but when I actually decided I was going for it, it was only a month or so before I turned in my notice. But wow, was I nervous about it! And I have no idea how long I plan to be out. I’m actually making money freelancing now, so I have no immediate plans to go back yet.